December 20, 2010  The Minnesota Vikings are playing an outdoor game at home for the first time in 29 years on a snowy Monday night in Minneapolis. ESPN reports that the game-time temperature is forecast at 19 degrees with a minus-1 windchill. December 20, 2010  Stephania Bell is a board-certified orthopedic clinical specialist, but she's also a big fantasy football buff. She managed to turn her expertise and her hobby into a brand new job: ESPN's fantasy football injury analyst. 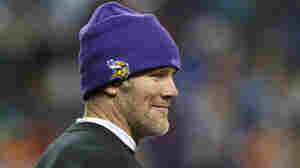 December 13, 2010  Brett Favre started 297 consecutive NFL games over 19 seasons. Now the streak is over, with the Minnesota Vikings quarterback unable to go against the New York Giants. December 13, 2010  Snow collapsed the cover at Minneapolis' Metrodome, forcing the NFL to move the Vikings-Giants game to Detroit. Motor City fans who want to see tonight's game won't have to pay. November 1, 2010  The Minnesota Vikings have waived the contract of receiver Randy Moss. The AP reports that coach Brad Childress told his players about the move Monday, one day after Moss and the Vikings suffered their third loss in four games. October 25, 2010  The debate over football, hard hits and premature deaths has gone in a million different directions. It'll kill football, fines aren't enough, fans are to blame. Sunday Night Football's Bob Costas appeals to the NFL to protect itself. July 29, 2010  President Barack Obama makes a cameo in the new Madden NFL 11 video game. If you make the Super Bowl, you get to meet him. November 11, 2009  Ken Carbone at Fast Company redesigns ugly NFL helmets.